And I remember now, the bird with the yellow crown—like the yellow cap my brother wore—which sat in the rocks by the sea. The water was its playground as it was my brother’s. Like that bird’s yellow cap, the boat anchored nearby reminded me too of Ed’s boat. I sat long, taking pictures. I remember our lunch had arrived and you grew impatient. I heard you call my name through the wind in my ears but pretended not to hear. Then it came again and again, your voice calling to me until finally I turned and broke the spell. You were still far off but had walked closer to get my attention and I could tell by your body, the muscles at your temples were tense. I was selfish that day with my time apart from you, as our food sat getting cold but I really thought he had come and was sitting there with me on those rocks, as we stared out together at the sea. He’d been gone only a year but it could have been thousands. I wanted to feel the warmth of his hand then in mine, assuring me all would be fine. I love you because of that memory. Because I see how deep our love has grown. I love you because, yesterday, seven years later, you remembered, and pointed out a bird on the rocks. There it stood, looking out towards the water. You told me that it had let you come within five feet of its wings and I should go get a picture. I noticed even in the distance his crown was in heaven and I no longer needed the bird to feel close to Ed. 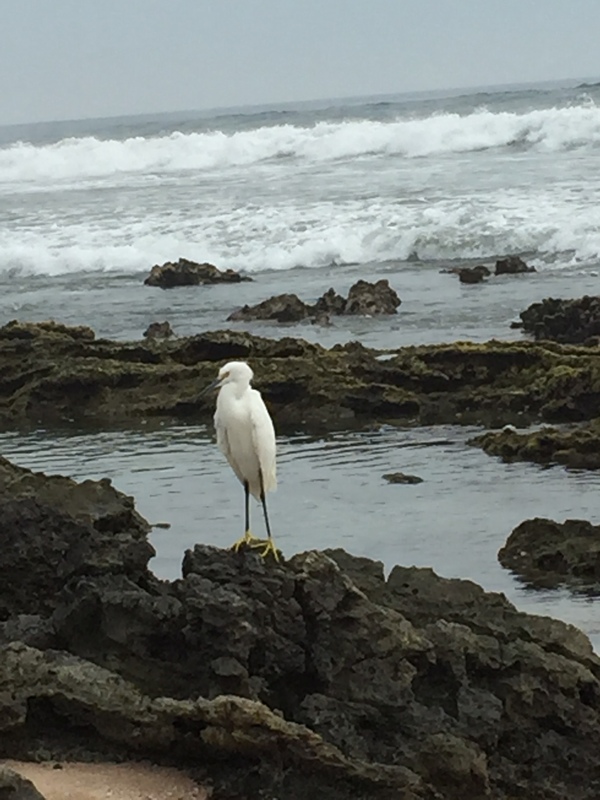 I looked out to its regal white feathers and wondered, how is it that a heart heals? You broke the silence again yesterday. She’s hurt, you said, as you watched the couple playing paddle ball. You watched her shake it off. I love you because you would have gone in a second to help if it was needed. I felt my heart then. We sat in the beauty, watching and waiting for lunch. When it came you noticed the caterpillar on your leg. You marveled at its countless legs as you scooped it up in your hand. I listened as you set it back on its leaf and said, There you go. It struggled a little and I love you because you watched it and cared. I love you because you looked and you studied and searched for that out of way place that just happened to have two chairs under the shade of a tree. The sun was high and hot, my skin pink where it craved the rays of light and knew better but you had warned me. Did you know I was watching as you walked far on the beach, away from the rocks and out past the waves? You dove in undaunted by their strength and the current that could pull you under and out. I watched and walked towards you because I didn’t want to lose you. Come by my side, you said the night before as I lost my balance near the railing by the steep hill below. Stay here, don’t go there, you spoke gently and I noticed your face had paled. I noticed your love then. I love you my darling because we have grown from two into one yet remained you and I, not just we. I love you because you are you and I’m me and yet we are we.